We’re lucky to have lots of original period features here at Moregeous Mansions because the house, unlike many in this area of Manchester, hasn’t been butchered by an HMO landlord. Coving and cornice, picture rail, fireplaces and corbels have all survived the decades as has the first floor and landing hallway wallpaper in the main house, curling round the staircase between skirting and dado rail. But I was never hugely fond of its Arts & Craftsy vibe, so I’d always imagined we’d simply remove it. Finally this week we’ve got round to starting on the hall and landing, stripping back the old crumbling plaster and doing the last of the mucky stuff before the house and new extension start to be put back together. The build has been hard work, costing more than estimated, so we’ve had to earn some more pennies before we can start the heating system and electrical installation. The hallway is fairly straightforward however, needing no pipe work and little cabling, so we can crack on with this very messy work. You often find in self builds / self renovations, that jobs will be done piecemeal like a jigsaw and not always in the ‘right’ order – sometimes a lack of funds means the cheaper stuff gets done before the costly stuff! 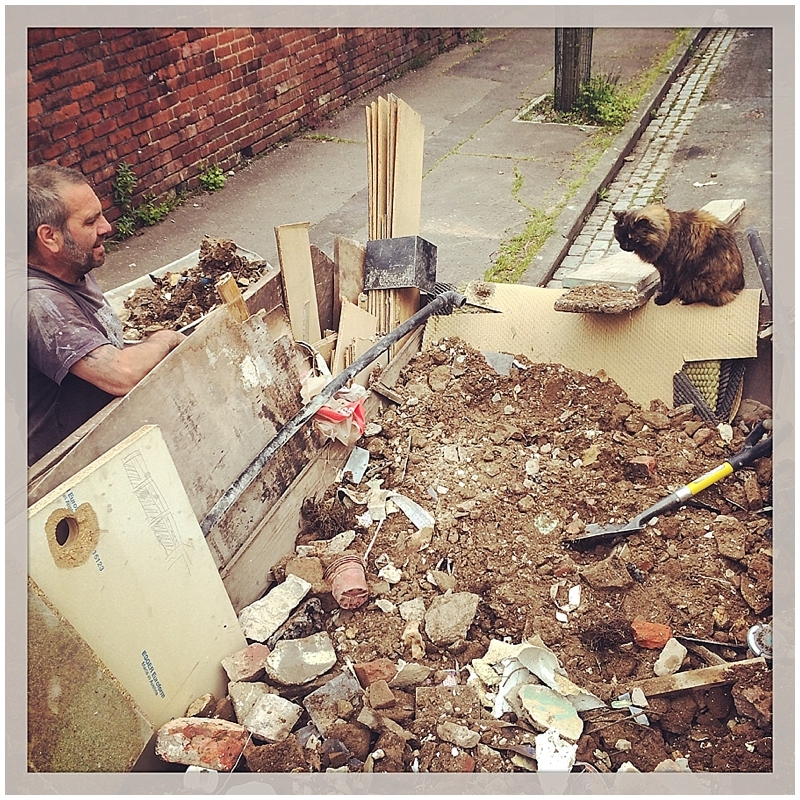 As I stood with my shovel in hand ready to bash the crumbly plaster off up on the first floor, a weird thing happened. I felt a pang of affection for the fish swimming along the skirting tops, the birds flying up to the dado and the butterflies swirling amongst the flowers. It felt a bit, well, heartless to just hack it off and put it in the skip. Wrong somehow. But once we’d taken the much plainer paper off the wall above the dado, the plaster behind it literally fell off the walls and the bottom half started to separate itself from the walls too……there was no going back, I could get my hand down between the wall and the plaster attached to the back of the paper!! Could it be saved? Could something cool & contemporary be created from this white painted paper? Would it even come off the wall in full pieces as it was so very brittle and possibly around 100yrs old? I could only try, and yes, they looked at me like I was mad. I’m getting used to that. I decided to try and slice down in sections as when we were gently pulling the paper forward, the weight of the old plaster on the back was cracking the front in all the wrong places. Using a sharp Stanley knife and a little plasterboard saw, me & Terry cut down to create smaller, more manageable pieces. I’m sure if this were some kind of precious, super expensive stately home it’d could be done much more slowly and carefully than this but for our purposes, this was fine. As we slowly peeled each section forward off the wall, I used a flat edged towel to carefully separate the old plaster from the skim coat, still stuck to the back of the paper, and removed each lump of plaster by hand, throwing it in a bucket next to me. This made each sheet much lighter and easier to lift away. We hadn’t done this with the first section and it was so heavy when it came away from the wall it cracked in two horizontally, accompanied by much swearing by me. Taking the plaster off the back as we worked was much better. When all the plaster was off the back, we carefully lifted the each section away from the wall, holding the sides and keeping them rigid. 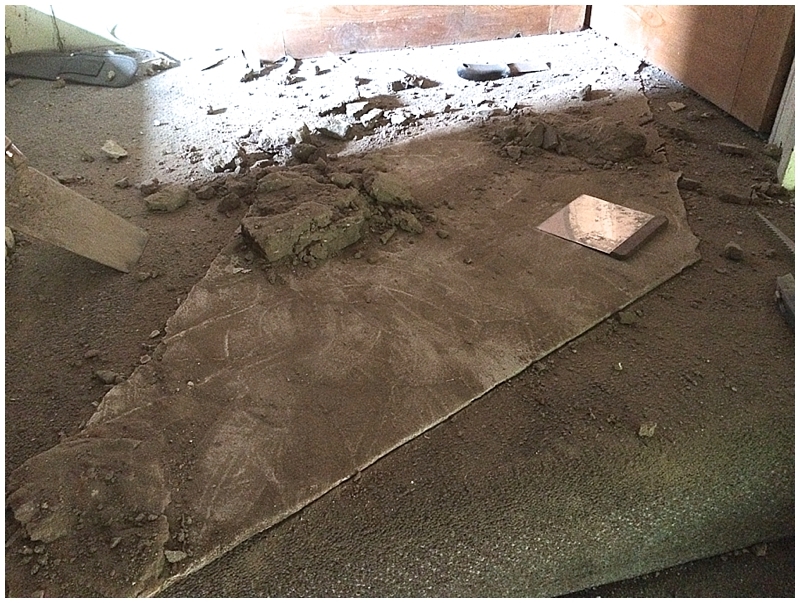 Then we lay them flat on the floor and I scraped the rest of the crumbling dusty plaster from the back using a wide flat, flexible scraper (see below), before storing the panels flat in a safe dry place! I’m going to create some fab friezes from the rescued sections and hang them against an internal bare brick wall, maybe with some of them painted or gilded, I’ve not quite decided yet. I’m delighted that I decided to make this effort in the midst of everything else we’ve to do but there’s still 8 metres of it to go so my Sunday’s going to be a busy one! Would you have gone to all this effort for that wallpaper? Am I potty or was it worth it?! Do Up Diary #60 Garage / workshop door installed & looking fine! what a lovley house with lovley period features. Sorry, I can’t see why you didn’t leave it in situ considering it had lasted over 100 years and painted the right colour would have looked timeless. You talk about the HMOs being butchered and it looks like you are doing the same in the hall – the shot of all the plaster being removed from the hallway is heartbreaking to watch. Another Homes under the Hammer ‘we love the period features’ beginning which ends in everything being ripped out. Sigh. Hi Peter, I understand where you are coming from, although your comment was incredibly harsh. 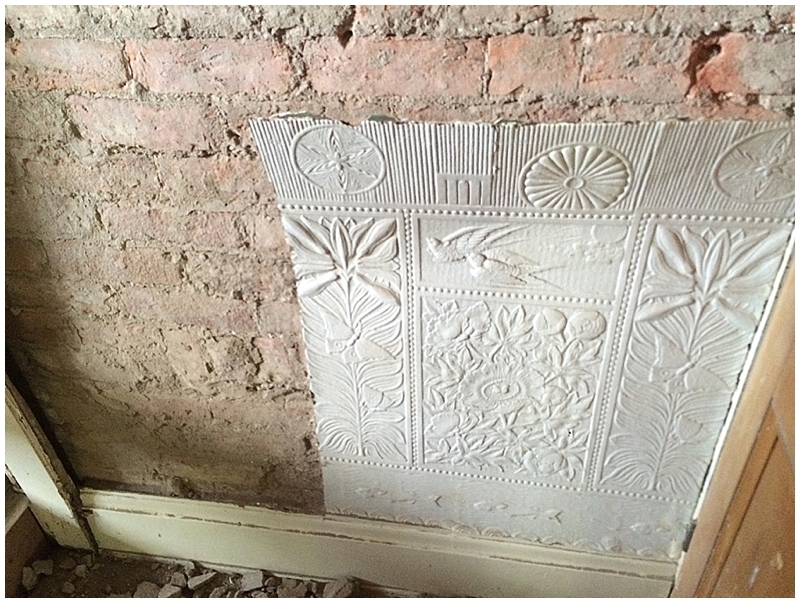 All of the original plaster had tumbled to dust and was completely unkeyed from the property brickwork. It could not be left in situ, maybe I didn’t make that clear in the post, not could it simply be painted. 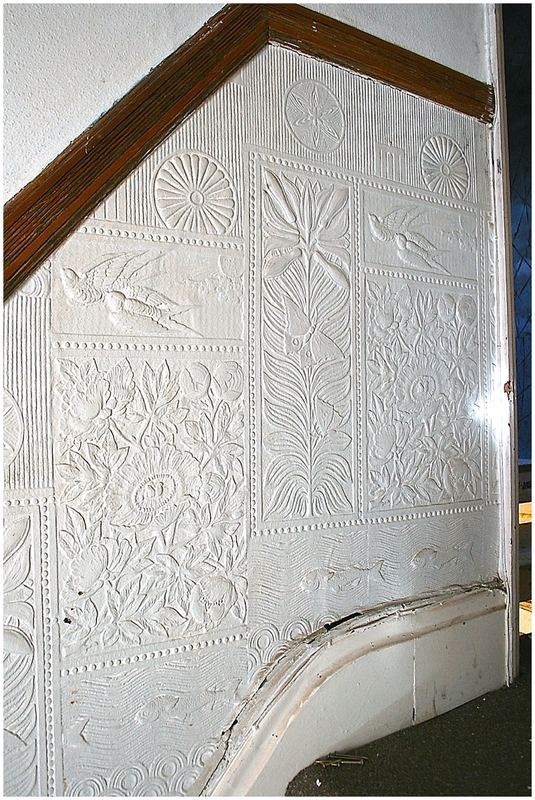 The weight of the thick unkeyed plaster was pushing the wallpaper forward and breaking it, as it’s very brittle. So, no, I’m not a butcher, nor is what we’re doing heartbreaking. We have spent three years carefully renovating this Edwardian villa and putting our hearts into it, living in dust to ensure this home survives for another 100yrs. So you can stick your “Sigh” up your bum.